Like most Minnesotans, what she knew of cannabis – the scientific term for the plant commonly known as marijuana – came mostly from popular culture. But that picture has changed dramatically. 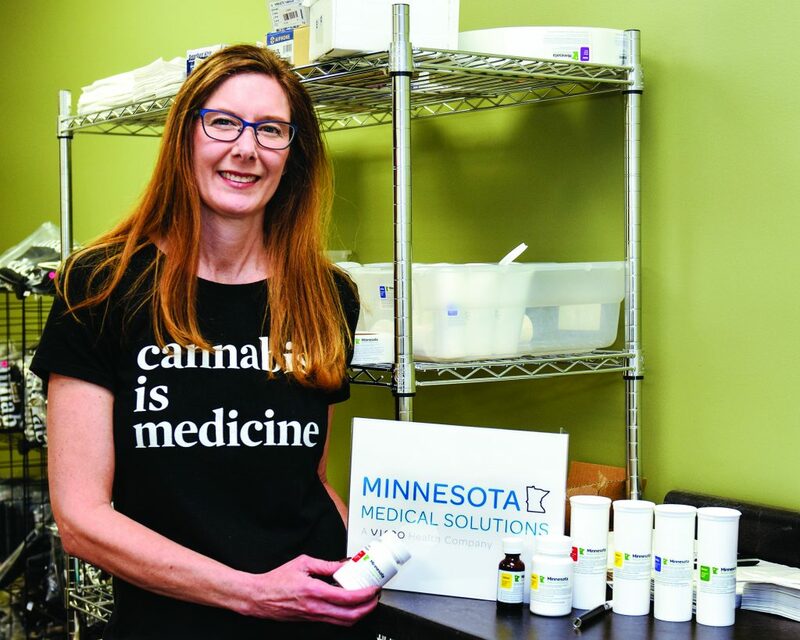 Today, as the principal professional on staff with MinnMed’s Moorhead pharmacy, she has come to know the challenges of dispensing cannabis-based medicines amidst controversy that still plagues them … and become a personal advocate for the relief she has seen them offer some of her patients. “Like my whole generation of pharmacists, I knew nothing about cannabis,” the 1995 NDSU graduate admits now. She had worked in retail pharmacies for 20 years amidst routine drug tests and widespread dismissal of the possible benefits of what’s still a Schedule I drug banned by federal law. With MinnMed, she stepped into a different world and a different kind of role. “I did love retail work, but there were times I felt like nothing more than a pill dispenser,” she reflects. This was to be very different. Physicians do not prescribe cannabis medicines. Instead, they certify patients have eligible conditions. The patients then consult directly with the MinnMed pharmacist, who recommends the next step. When Jolene joined the firm, she was trained by MinnMed to take on the role of listener and adviser and – in a very real way – to partner with her patients in their care. “They come to see me and we talk about their situation, their pain,” she explains. “Then we decide together how we’ll going to start out. Everyone is different. Everyone’s system responds a little differently. Approved by the Minnesota Legislature in 2014, medical cannabis has been available here under tight controls since mid-2015, when Moorhead become one of four sites assigned to the newly formed, doctor-led MinnMed corporation, now known as Vireo. The dispensary in a former Subway spot at the corner of Main and Seventh Street South is the smallest of the company’s four sites, with others in Minneapolis, Bloomington and Rochester. A second company, LeafLine Labs, serves St. Paul, Eagan, St. Cloud and Hibbing. Minnesota’s medical cannabis regulations recognize 14 qualifying conditions, from intractable pain – the problem reported by 65% of patients – to PTSD (16%); severe muscle spasms, including those of MS and ALS; HIV/AIDS; seizures; Crohn’s disease; cancer; and several other diagnoses. Citizens can petition to add more conditions to the state’s list; that resulted in the addition of autism and obstructive sleep apnea last year and, most recently, Alzheimer’s disease, for which certification will be offered starting in July. To qualify to purchase cannabis products, potential patients must be certified by a physician and then registered with the state Department of Health. They’re charged $200 per year for the privilege, though people on Medicaid and several other programs may pay a reduced amount. Like the other 32 states that permit medical cannabis sales, Minnesota is an island unto itself. Qualified patients must be Minnesota residents and be certified by Minnesota physicians. Though North Dakota’s first dispensary recently opened in Fargo, it’s off limits to its neighbors across the Red. Nor can Minnesota-certified patients travel out of state with their legally acquired medications. Jolene notes that a patient who drives to Moorhead from Warroad, for example, cannot legally round out his visit with shopping across the line at West Acres with his prescription in his pocket. Every aspect of the medical cannabis business is closely regulated by the Department of Health. That includes everything from the low-kay exterior signage to corporate publications and websites – no references to marijuana or images of leaves permitted. All forms of advertising are forbidden. Products cannot be delivered by mail, and all purchases must be paid in cash or with debit cards. The Moorhead dispensary, like all the Minnesota spots, provides products in several forms: capsules or pills, topical applications applied to the skin, oils ingested through vaping, and oral solutions. It cannot sell anything in plant form. Its medicines combine THC and CBD, two chemical components, in nine staggered ratios to fit the conditions being treated. All of MinnMed’s formulations are refined from plants grown in its Otsego, Minn., facility. The physician-owned company was originally established to serve Minnesota, perhaps the most closely regulated of the 33 states now permitting sales. Since then, it has expanded into six other states, though not North Dakota. The Moorhead pharmacist cautions that cannabis-based medicines, like other pharmaceuticals, are not a cure-all. Nor are they a good fit for every patient. “Some drop out because side effects prevent us from reaching the level of relief,” she notes, citing dizziness, fogginess or sleepiness. In other cases, she’s wary of potential interactions with other prescribed drugs, among them blood pressure and anxiety medications. “We monitor them closely,” she adds. Cost, too, can be a limiting factor. Patients typically spend from $100 to $400 a month, with seizure conditions on the upper end. Insurance does not cover cannabis-derived medications. She adds, “This is the most rewarding job I have ever had. Watching some patients come back for a second consult virtually skipping in the door because they feel so much better – it’s a wonderful thing to see.